The PolyDrain polymer concrete trench drain system is well suited to a wide variety of surface drainage applications. The ABT PolyDrain precast trench drain system provides modular design flexibility, facilitates construction accuracy, requires less installation labor and skill, and has lower installed cost when compared to conventional hand-formed cast-in-place methods of creating trench drains. TrenchFormer is a pre-engineered, cast-in-place concrete forming system for forming surface drainage trenches, catch basins, utility chases, and voids in concrete placements. The system includes expanded polystyrene (EPS) form profiles, steel inlay rails, patented no-float legs, grates, and grate retainers. TrenchFormer is available in various width, depths, slopes and trench bottom configurations. 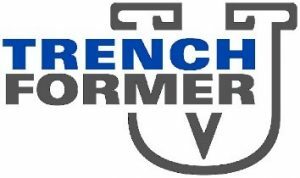 TrenchFormer replaces hand-forming, heavy materials, keyways and waterstops normally required with trench drains and utility chases. Its components are made in the most commonly constructed sizes. TrenchFormer consists of 8 ft. (2.4 M ) pre-sloped form segments. Former sections are available in a variety of slopes. The segments have integral deforming grooves for easy removal and full length longitudinal grooves for coplanar rail spacing. The steel components are angle rails with anchoring studs welded on 11 in. (280 mm) centers to the outside corners. 1/2 in. (12.7 mm) threaded U-shaped no-float legs attach to horizontal tabs on each rail. Each rail end is designed to accept a Rail Alignment Clip which retains adjacent rail segments. Prefabricated L-rail and T-rail assemblies allow for field installation of 90° turns anywhere in the pre-sloped layout. These assemblies have rail reinforcement built into the areas where the grates are unsupported in other systems. This reinforcement provides load capacity for AASHTO H2O load ratings. Outlet piping is butted to an annular groove made in the EPS form prior to concreting. For trench junctions or for large outlet sizes, four catch basins are provided. A selection of gratings and solid covers is available for various loadings.